In recent decade, fast foods have become a part of our lives. Most of the working people are dependent on fast foods. 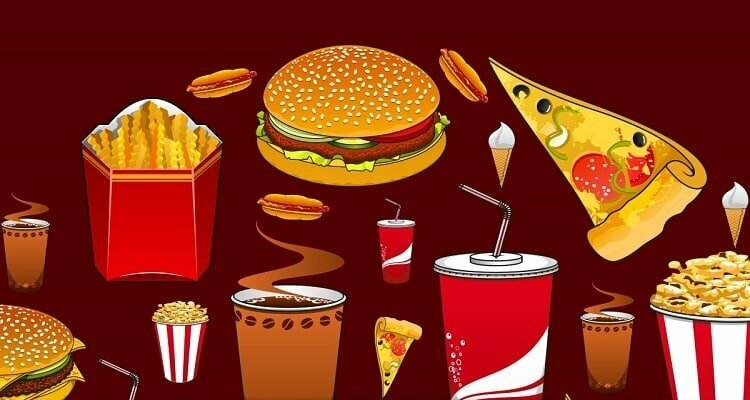 These fast food centers have penetrated in every corner of the city, Most of us love fast food, but every time we consume fast food we compromise our health as with the rising trend of fast food, there has also been a rise in health problems. Hence, diseases like obesity, depression, diabetes, nutrient deficiency and many other chronic health conditions. They are mouth watering and delicious but their consequences can be terrible. This mouth watering dish is one of the most opted choices in fast foods, but this yummy dish is also full of ill effects. The more you eat pizza the more you increase your cholesterol level which raises the chances of heart disease. The saturate fats in the main crust of pizza may block the arteries and create a situation of heart attack. The carbohydrates present in pizza may strongly effect to the level of your body glucose. Hamburgers can be eaten as a snack, lunch or dinner; they are available in every corner of city. They are mostly consumed with fries with a filling of cheese, potato, meat, onion, mushrooms etc, which highly increases its calorie and cholesterol level in it. The bun is made up of refined sugar and has lots of saturated fats in it which increase the chances of getting diabetes. Hamburgers are hazardous to health as they may cause heart disease or blood pressure to an individual. It is mostly served in chains where they are made in big centralized kitchen and they are then trucked to different cities and places. In this procedure their freshness becomes a question. On the other hand if they are cooked fresh, then one should be aware of the ingredients used in it. The oil used to fry them is not changed often and hence they are highly hazardous to our health. They radically increase the chances of diabetes and heart diseases. It decreases our immune system and damages our health. The shakes which are ready to drink are called pre-mixed shakes. They are made in bulk and then transferred to wholesellers and retailers and then finally they reach to you. These are properly packed in containers but the materials they use to make these containers are very harmful to health. Sometimes in hurry people in forget to check their expiry date before consumption. Choosing a fresh juice instead of packed one may be a wise decision. Noodles are made up of flour, a delicious dish which is loved worldwide. These are made up of a variety of shapes and sizes, these are served with combination of vegetables or non veg. it is very delicious, yet it is dangerous as it may cause digestion related problems, diarrhea or blood pressure. Since they are made of refined flour, they may also cause abdominal discomfort or chronic bloating. Carbohydrates present in noodles tighten the insulin response. Cheese is a fermented food made from milk, usually cow, goat or sheep’s’ milk. Cheese sandwich is a favorite comfort for adults as well as children; crispy toast and melted cheese give a heavenly experience in mouth. However, the ingredients used in cheese sandwich are not so divine; they are very high in calories and low in fiber. Cheese is rich in calcium and protein but at the same time it is also rich in fats. It is mainly grilled with butter or margarine which increases its calorie level. Cheese is high in calories and salt so it may cause hypertension, blood pressure or weight gain. French fries are one of the most readily available fast food, eaten in every corner of the country. French fries are potato cut into pieces and deep fried. It contains lots of salt and acryl amide (a chemical which may cause cancer). If consumed regularly, they may cause serious health disease. Deep frying increases the calorie level and cause obesity. It is rich in carbohydrates. Carbohydrates are good for health; however access of anything is harmful. Hot dog is a cooked sausage, traditionally grilled or steamed and served in a sliced bun as a sandwich. Hot dogs can cause cancer. Yes! It is true, hot dogs are preserved with nitrites, and during cooking process nitrites combine with amines in the human stomach to form N-nitroso compounds. Hot dogs are also in rich in cholesterol increasing saturated fat and sodium. If consumed often, then it may cause serious health problems. Pasta is refined product made from grains. Studies prove that the high amount of carbohydrates in pasta affects the blood sugar level of human body. Pasta also has glutens in it and hence some people cannot digest it. If consumed over years then you may become diabetic. Pastas may also cause severely aggravating the pelvic pain in a disease condition called endometriosis. Chicken nuggets may be rich in protein but the same time they are also rich in cholesterol and fats. It was also revealed that a very popular food chain’s chicken nuggets contain dimethylpolysiloxene. It is a polymer of silicone. Yes! You read it correct, it contains silicone. Sooner or later, silicone can cause worst effect in human body. Above all nobody can be sure about the freshness of chicken used in it.